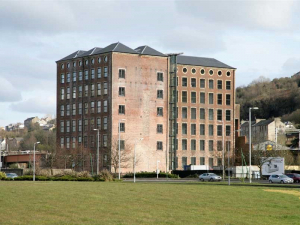 Reclamation project for derelict seven storey landmark building in Port Glasgow formerly to Gourock Ropeworks. Converted to form 35 loft apartments with basic finishes to reflect the character of the building and allow purchasers to customise interior finishes to their own taste. The services are designed in a New York loft style and are exposed and visible throughout, including cabling on galvanised cable tray and copper pipework.